“… his presentation slides were light on text and heavy on images. This style of delivering presentations is fresh, engaging, and ultimately far more effective than slide after slide of wordy bullet points. Not only is this article touting the efficacy of this presentation technique two years behind our recommendations, it is SIX years behind the dates of many of the resources we cited in our 2009 COABE presentation. WE thought we were bringing an established practice to the field of Adult Literacy/ESOL education – which is often somewhat behind major technological changes in the corporate world. Funny to find we were AHEAD of (or at least on par with) many in industry. That is new news to me – I’d love to see that research cited somewhere. I’ve written the author to see if he can send me a citation. In any case, one issue is clear – PowerPoints should be VISUAL – not text-based!!! 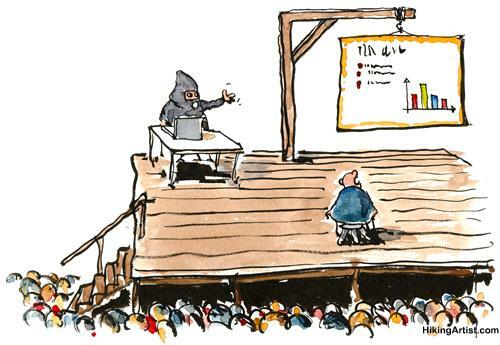 Join us in the (half-decade old) movement to stop ‘Death by Powerpoint’ and ineffective presentations!